I’ve decided to auction off this Darkest Hour UK quad. 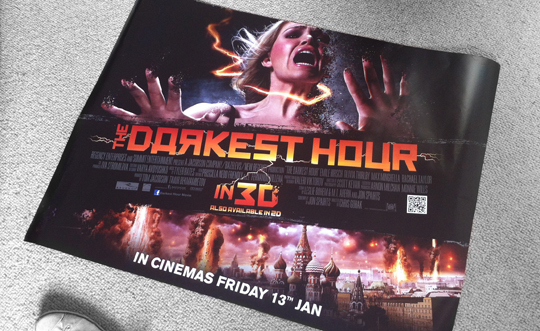 By some strange coincidence, a courier arrived on Wednesday afternoon while I was writing my review of The Darkest Hour to deliver me the film’s poster. As you’ll know if you’ve read the review, my impartiality was not affected by this generous offering. Because I have little interest in devoting any more of my life to the film, I’ve decided to auction off the poster to raise money for the Red Cross. 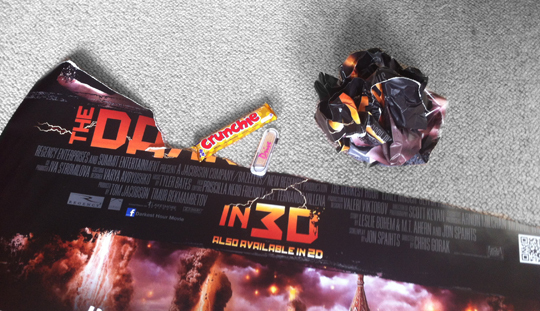 And to make the prospect more attractive I’ve torn it in half, scrunched one piece into a ball and thrown in some Drive toothpicks and a Crunchie. To make an offer on all of the above, simply go to THIS EBAY AUCTION at any point in the next three days and place your bid. With your help, at least some good can come of this unspeakable atrocity.